Page 6 of The Mythic Roots of Western Culture’s Alienation from Nature. Adams and Belasco. Tapestry Institute Occasional Papers, Volume 1, Number 3. July, 2015. Outline / List of Headings available here. In both Lawrence of Arabia and Silverado, the “ordinary” people who are the stories’ Heroes do not live in the desert but merely travel through it on their Hero’s Journey. 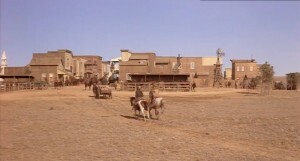 In Silverado, the desert journey part of the story is short and occurs early to establish the “Hero’s Journey” theme in the viewers’ unconscious minds. Subsequent scenes that take place in less stereotypical desert landscapes (buttes and basins rather than sand dunes) are also ones of passage rather than residence. By contrast, much of Lawrence of Arabia takes place in the desert, but we still see that Lawrence enters the desert at the story’s beginning and then leaves at the end. He does not live there permanently. This transitory attribute of desert experience reflects both the archetypally deadly nature of the desert and the role of landscape as Challenger — not destination or home — in the Hero’s Journey Myth. A third archetypal attribute of the Fiery Desert as it appears in Myth through Lawrence of Arabia can be seen in an important shift that takes place during the “match cut.” Before that cut, the viewer is indoors — literally within protective walls that separate people from the desert’s hot sun. After the match cut, the viewer is outside, in the “burning, fiery furnace” that will mythically challenge and test the Hero. Remember Campbell’s words: the Hero journeys outside “the society that would have protected [him], and into the dark forest, into the world of fire, of original experience.” Inside, within the walls of the massive headquarters building, the Hero Lawrence is in a place of protection that’s fundamentally different from the desert outside. Two of the Heroes ride out of the fiery desert and into the walls of a fort. From Silverado. 1985. Complete citation and Fair Use statement in ref. 18. While the role of protective walls in Lawrence of Arabia may seem so subtle as to be unimportant, remember that the same motif shows up in the opening sequence of Silverado: the hero is initially inside and then opens the door during the early dramatic cut to the outside. This parallel with the inside-to-outside cut seen in Lawrence of Arabia is extremely significant. In Silverado, the Heroes go on to ride out of the desert again and back inside protective walls — this time the walls of a fort. This scene is important because it allows us to see the building and its walls from outside first, rather than from inside (as in the cabin and even Lawrence’s headquarters building) and so gain a different and very important perspective on this attribute of the myth. Two of the Heroes ride into a settled town surrounded by farms, ranches, trade routes, and business. This environment provides more safety from the wilderness than does an isolated fort. From Silverado. 1985. Complete citation and Fair Use statement in ref. 18. Protective walls may constitute a fortress that stands like an island in the middle of the wild landscape, as do both the cabin and fort in Silverado, or they may be the larger civilized areas of “settled” towns and cities, as in the headquarters building of Lawrence of Arabia. The actual security or safety of a building varies according to the ratio of wild Outside to walled Inside in a given area. 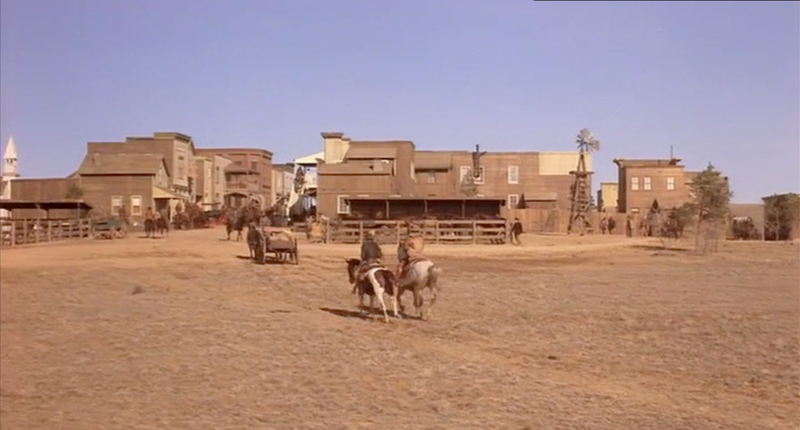 Thus the tiny, thin-walled cabin in the opening scenes of Silverado, which is surrounded by miles of wilderness and no other people or structures, is not as safe as the thick-walled fort that covers several acres and contains numerous smaller buildings and many people. The isolated fort is likewise not as safe as a town of numerous walled buildings surrounded by settled agricultural land, trade routes, and businesses (27). We can summarize the attributes of the Fiery Desert as it appears in the Hero’s Journey Myth. Notice that this myth exists within the Ruthless view of nature. It expresses the Fear motif as a base state of human-nature relationship, but the victorious Hero flips this to the Master motif. The desert is a lethally hot and dry environment that ordinary people cannot survive, a wasteland without water, food, or shade. As a result, the desert tests human beings in a way that forges Heroes of those who survive its passage. The desert is not a place where people live, but a landscape through which people journey on a testing “Hero’s Journey” quest. The normal landscape of human existence is within the walls of buildings that protect them from the desert. A Hero leaves the walls that normally protect him and other people, goes into the desert to accomplish a Hero’s Journey, and then returns to the walls of safety and society that constitute normal human habitation. 27. 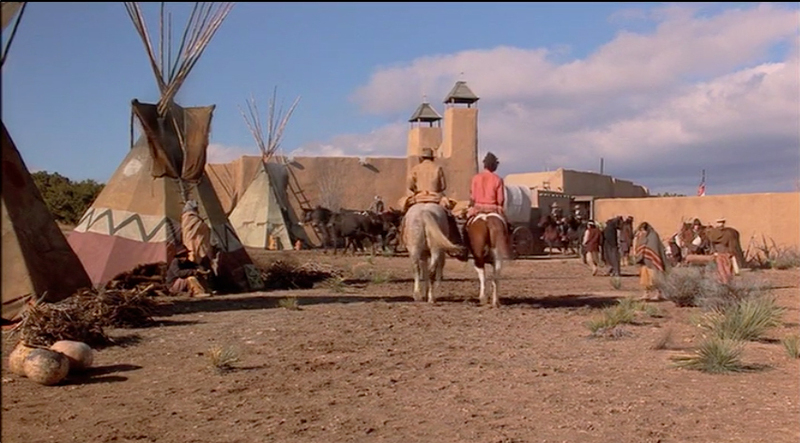 In the Western film genre in particular, violence can occur inside forts and towns. That’s one of the common motifs of the genre, in fact. But this violence comes from other human beings, not from the Fiery Desert itself. A traveler in the desert might succumb to heat stroke and thirst, but people in forts or towns are generally seen as safe from such dangers.